I have become very addicted to ramen. Not that I didn´t have it before, I did, but I kept forgetting it. But lately I have eaten unforgettable ramen! 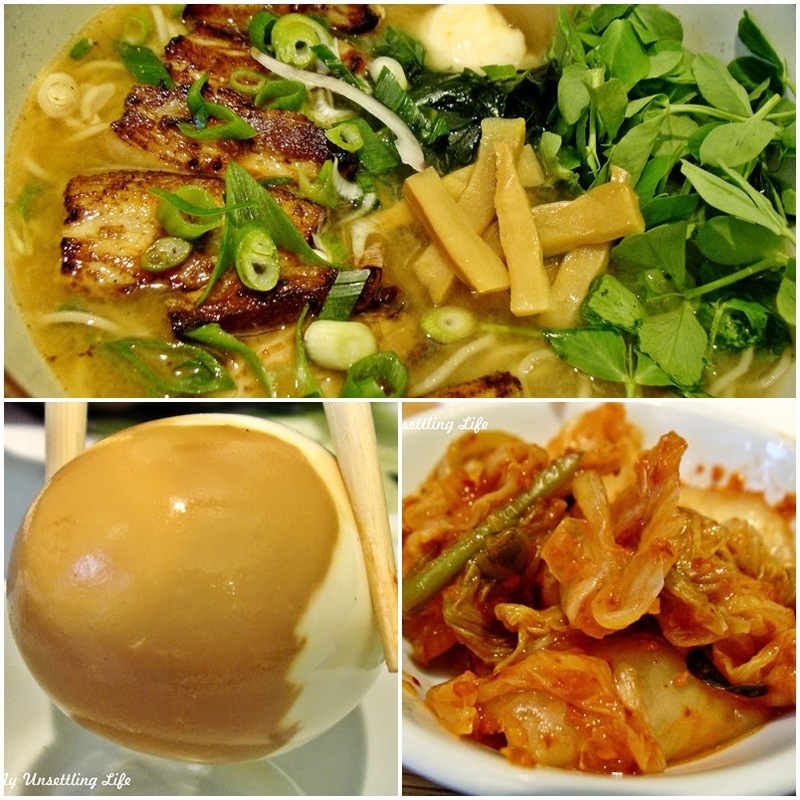 The best ramen I ever ate was at a very rustic looking restaurant in London. And it was cooler because we had it on the Chinese new year. Unfortunately I don´t remember the name of the restaurant right now, but if I ever do, I will let you know. In the area I live we don´t have proper Chinese or Japanese restaurants that do a proper ramen, but the closest thing we have is Wagamama. Which I must say, does a very good job in their food! We´ve had a few different ramens there, but one that we enjoyed very much was the Pork Ramen. According to Wagamama´s description of it it is "noodles in a miso, ginger and chicken soup topped with barbecued pork, a tea stained egg, pea shoots and wakame. Served with a Korean barbecue sauce and garnished with menma and spring onions". Wagamama´s Pork Ramen, tea-stained egg, and kimchi. Trust me, the picture is beautiful, but the flavour is even better! Out of curiosity I researched a bit about it. So, ramen is considered a Japanese noodle soup, that consists of noodles served in a meat flavoured broth with soy sauce or miso, and has pieces of the chosen meat, and some greens. Each region in Asia has their own style of ramen, with a variety of items in it. It´s origin is a bit unclear referent to the time and place of its beginning. Ramen is seen as an art to make, that take professionals specialized in it to master. You can get an idea of it by watching the movie "Ramen Girl". But the coolest and weirdest thing I learnt researching was that ramen has a museum called Shin-Yokohama Raumen Museum, in Japan. What about you, do you like ramen? Would like to know how to make a simple ramen at home? Would you go to the ramen´s museum? I love ramen and can practically live on the stuff ... delish!